New from AMI . . . This book addresses itself to the executive corporate Coaches who support leaders on their journey of achievement. 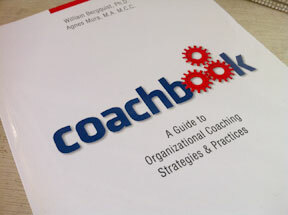 Coachbook provides the most comprehensive survey for the practicing organizational coach and those who coordinate coaching programs within organizations. It updates and contextualizes the thinking of the experienced coach, and provides a well-researched foundation for the newer coach. Equipped with personal leadership and business experience as well as scholarly backgrounds in organizational psychology, philosophy, linguistics and executive development, Bergquist and Mura have 50 combined years of working as coaches throughout the world. Interweaving theory and practice, they have constructed a framework of masterful organizational coaching strategies that address the most frequent and delicate coaching scenarios. 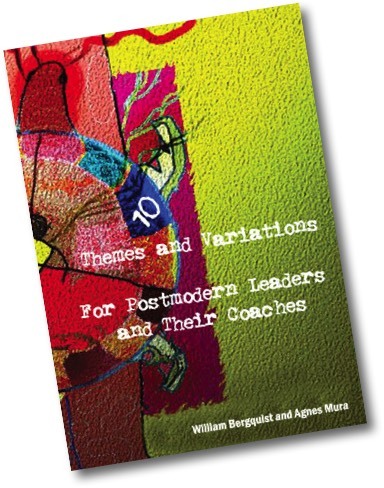 The last section of the book includes over 30 ready-to-use Coaching Resources - tools that have been carefully selected and have repeatedly proven useful and appropriate in a vast variety of challenging coaching engagements. The field called organizational coaching emerged at the same time (during the 1990s) as many organizational analysts began identifying and describing a postmodern world of complexity, unpredictability and turbulence. In this world, leaders (and their coaches) find the edges of their personal and professional abilities constantly challenged by flatter, networked, global workforces and vertiginously changing business landscapes. "Over the past 2 decades numerous coach training and certification programs have emerged, most with their own brand of processes and applicable models. Yet at the same time experienced coaches -- those even with up to 30 years in the field of leadership development -- have been requesting resources that bring the effective, yet disparate, approaches to coaching together in a context that both updates their learning and also gives new coaches a solid, broad foundation upon which to build. This coachbook does just that for both the professional coach just starting their coaching career, as well as the most tenured leader coach who wants to challenge their current knowledge and competencies. It is a must have addition to the continuous learning of the professional leader coach." Dr. Jeannine Sandstrom, MCC, leadership author, CEO of CoachWorks Intl., and founding member of Corporate Coach University, The International Journal of Coaching in Organizations and the International Consortium for Coaching in Organizations. "In these complex, uncertain and turbulent times there are no success formulas for leaders to follow to achieve continual results. Therefore, executive coaches need a diverse set of tools and models to draw on to best help leaders create novel strategies and plans. coachbook offers the most comprehensive look at tools and models coaches can use for navigating interpersonal, decisional, and aspirational goals with their clients. The book is both practical and profound, and a much-needed guide for anyone involved in helping leaders bring out the best in others and in themselves." What are the paradoxes and whip-lashing changes that make up our world? If we can never fully adjust to the chaos and turbulence, where do we find time and space for renewal? How do we know that something is true when it’s all in the telling and hearing of stories? If many significant organizational changes are irreversible, how “inevitable” is growth? Organizations are both unpredictable and conservative; what leverage points can set in motion positive change? Humans left the Savannah relatively recently; how are we adapting to today’s biologically vastly different world? Given that the human brain operates at several levels, providing multiple intelligences, how can we stay both alert, relaxed and… in flow?